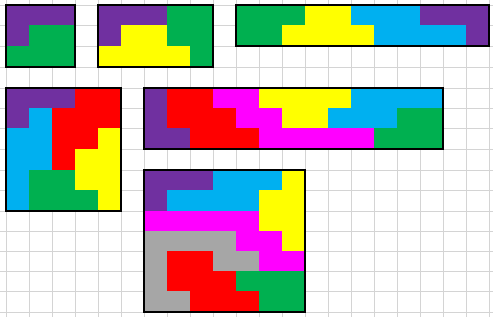 Here's another set of polyominoes (sizes 4,5,6,7,8,9,10) that you can print and cut out. As before, the two smallest (same pieces as previous version) make a 3x3. The rest of the pieces are different. Also as before, add a piece at a time to make a 3x5, 11x2, 5x6, 3x13 and 7x7. If I feel energetic I might extend this by adding an 11-omino (6x10) and 12-omino (8*9). The reason the first two are the same... those are the only two that work. 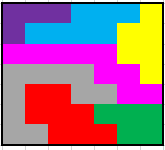 I made the pictures with excel. Manually selecting the cells in the correct shape and colouring might not be the most efficient way for trial and error, but it creates pretty good pictures.